Rutgers plays Iowa State in the Pinstripe Bowl Dec. 30. I can't say I've ever made it out to the stadium for a non-Yankees game, but I bet it would be an interesting experience. Anyone ever been to a bowl game at Yankee Stadium? If yes, I'd love to hear what it's like. If not, do you like the idea? The stadium is only a few years old and it already has hosted an array of non-baseball events. The first occasion was actually a prayer service, held by pastor Joel Osteen. Here's a look at the first boxing match in the Bronx since 1976: Miguel Cotto vs. Yuri Foreman on June 5, 2010. 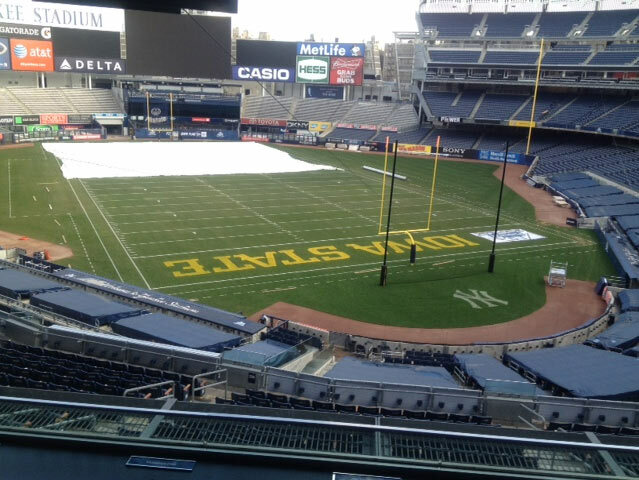 The stadium's first Pinstripe Bowl was a year ago to the day of the upcoming game, featuring Syracuse and Kansas State. My sister and a few other friends of mine made it out to the first concert at Yankee Stadium Sept. 13, 2010. I heard it was amazing. Another friend of mine attended one of Paul McCartney's two shows at Yankee Stadium this past summer. Here's a video account of the famous Beatle singing "Golden Slumbers."